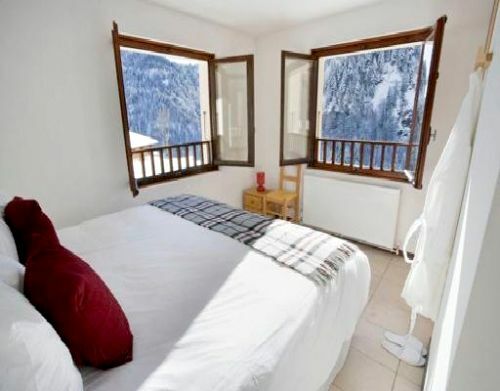 Chalet La Giettaz is funky yet family friendly ski chalet newly converted into 10 simple and stylish 1- 4 bedroom apartments by its friendly owners. 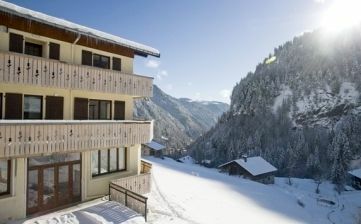 There are glorious views from its scenic setting within a pretty and unspoilt Alpine village, with easy access to around 400kms of pistes within the Evasion Mont Blanc. Ex-pat Brits Miranda and Chris clearly have a keen eye on what it takes to enjoy a successful ski trip ‘en famille’ and supply a host of useful gear and services to ensure a stress-free break. 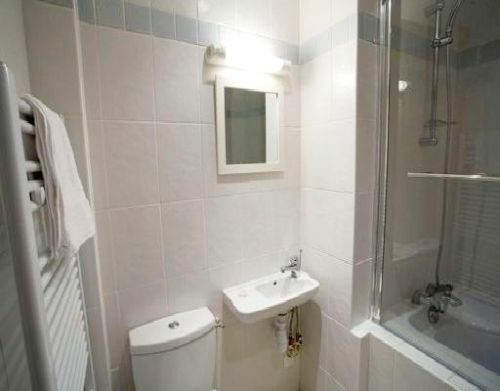 Parents can travel light, thanks to a long list of baby and toddler gear supplied (see Fast Facts for full list) and experience laid back self-catering thanks to daily breakfast deliveries, twice weekly grocery runs and pre-bookable evening meals in the cosy communal lounge bar. In fact, apart from knocking up the odd formula feed or light meal for the nippers, families tend to enjoy the added space rather than the top notch facilities offered by the apartment’s living areas more commonly using them for board games or DVD nights than anything else. 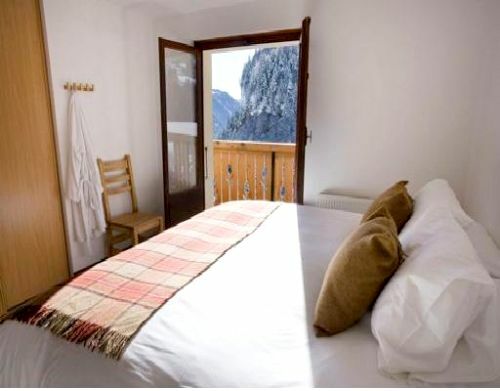 As well as well equipped apartments, the Chalet boasts great shared facilities including a Jacuzzi, sauna and a comfortable in-house lounge bar, which offers pre-bookable evening meals for adults and junior guests. A raft of baby monitors are provided so that grown-ups can continue to enjoy sociable evenings after little ones are tucked up in bed and, trusted local babysitters are on hand so parents can enjoy a night out at one of the village’s selection of bistros and bars, although many deliver so parents need not venture out if they prefer not to. The village is just a five minute drive (transfers provided) from the local lifts and crèche, but its slightly off the beaten track position has meant its kept its charm as proper Alpine village and not suffered the ravages of a purpose built resort. There are several good restaurants and bars, and easy access by bus to the larger nearby resorts of Megève, Combloux and St-Gervais. Each of the Chalet's 10 apartments are light, spacious and simply but stylishly furnished. 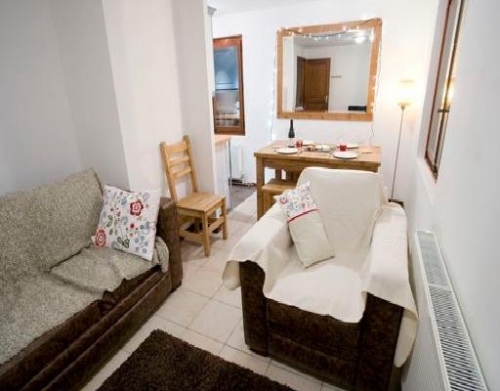 They range from one-bedroom to four bedroom, and come with amazing mountain views, Wi-Fi, IPod docks, Flatscreen TVs, DVD players and fully fitted kitchens, complete with hobs, cookers, fridge freezers and dishwashers (most come with a washer/dryer too). 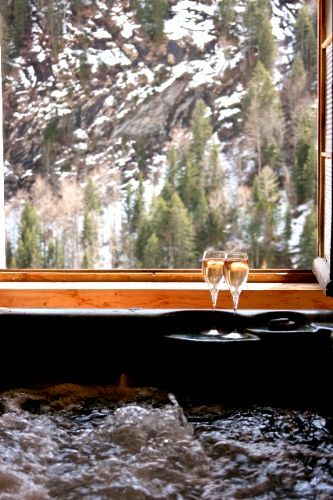 The chalet's ‘spa’ area with its large hot tub and sauna, perfect for relaxing after a long day on the slopes, can be reserved for exclusive use. 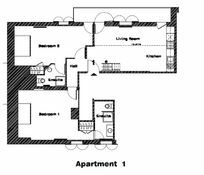 The 2 bed apartment has two large ensuites bedrooms both of which can hold either a very large double bed (182 cm width) or two single beds (91 cm width). 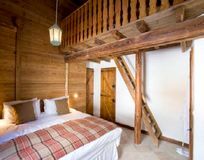 There is also a mezzanine floor above the living room with two single beds (80 cm width) in a space best-suited for kids. The kitchen and living area have balconies and windows offering spectacular views of the surroundings. To see more apartments within the chalet please click here. The pretty rustic village of La Giettaz, nestling in a breathtakingly scenic valley in the French Alpine region of Reblochon beneath the iconic peak of Mount Blanc, is perfect for a family holiday in the winter or summer. Skiing is the big draw, and quite rightly so. It's five minutes by chalet shuttle or ski bus to the lift that goes straight up to the Evasion Mont-Blanc ski domain and over 400km of pistes between La Giettaz and the larger resorts of Megève, Combloux and St-Gervais. Parents can drop off their little ones at the great creche at Le Plan, which operated throughout the ski season and right next to the lift. It's friendly, English-speaking staff have received glowing praise from last year's guests. Slightly older children can be part of the winter fun. The Chalet supplies sledges for playing in the snow, and the ESF ski school at Le Plan offers skiing and snowboarding lessons from 3-4 years upwards. But there are other attractions than snow. Alongside two winter sport stores, a grocer, a baker, a hairdresser and a post office, La Giettaz has a charming little museum that preserves the life and crafts of the 19th century and a scattering of cosy bars and restaurants. For little ones, there's a playground with swings and slides. Lively villages such as Megève and La Clusaz are a 20-minute drive away and offer a world of delights for grown-up gastronomes, with lots of local shops and markets selling famous delicacies such as Reblochon, Chevrotin, Tomme, Gruyère and Abondance cheese, as well as the bread, pastries and meats that are a central part of the regional Savoyard cuisine. Children will love the swimming pools in both Megève and La Clusaz. The region is well worth a summer visit too. 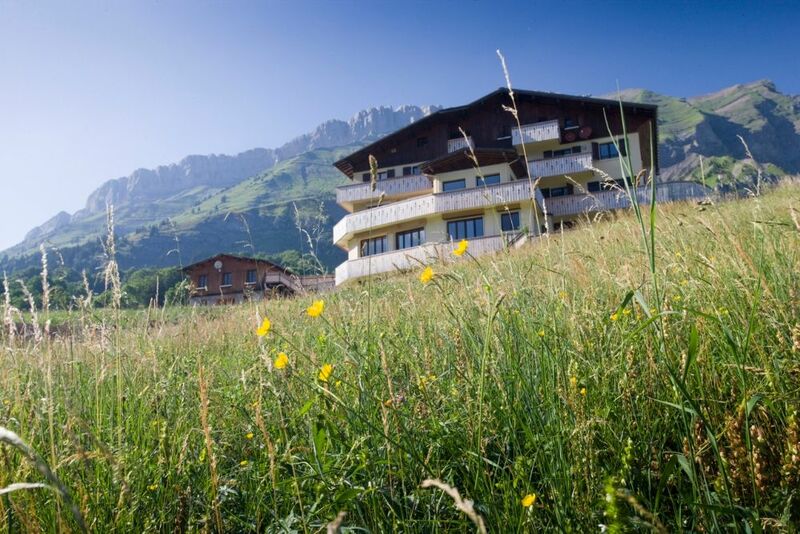 Curious under-fives will enjoy visiting the friendly farmer next to the Chalet who welcomes visitors of all ages, and the surrounding mountains, valleys, forests, lakes and waterfalls make a stunning natural warm weather playground for mum, dad and baby too. 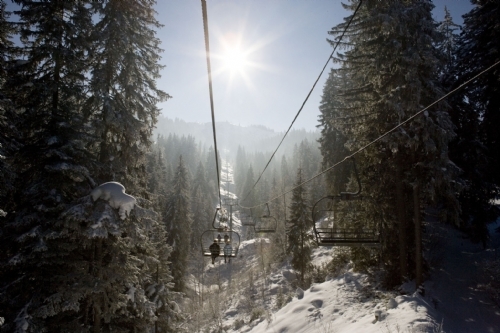 Getting There By Air: The Chalet is just 80km from Geneva airport and transfers can be arranged on request. Getting There By Train: The famous Eurostar Ski Train runs direct from London to Moutiers, just over 50km from La Giettaz, overnight on Fridays and through the day on Saturdays in as little as six and a half hours. The nearest stations served by France’s excellent TGV network are Annecy and Albertville, both less than one hour’s drive from La Giettaz. Transfers from all train stations mentioned can be arranged on request. 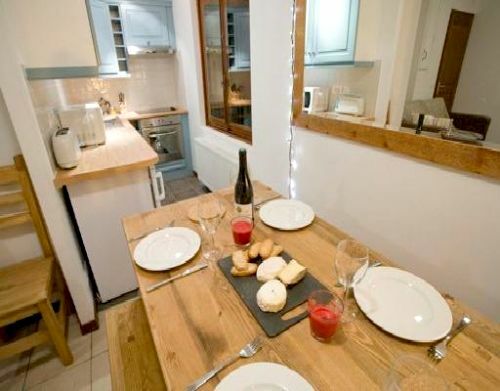 Sleeps up 6+ cots in two large bedrooms, both of which can hold either a large double bed/two single beds. 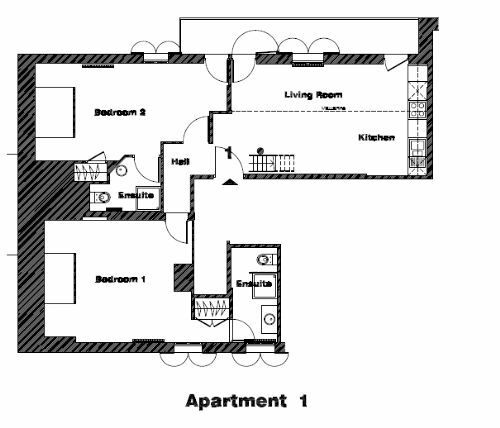 There is also a mezzanine floor above the living room of this apartment, with two single beds. 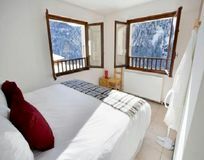 The Chalet is just 80km from Geneva airport and transfers can be arranged on request. There is a 'biotope' - an environmentally friendly pool - is a short drive away in Combloux, while the outdoor swimming lake at Flumet is situated in an equally beautiful setting. 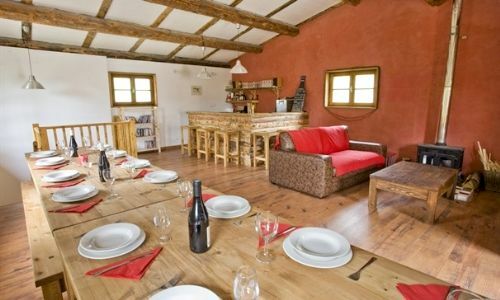 La Giettaz is home to a small number of cosy bars and restaurants that offer a warm welcome to visitors and locals alike. 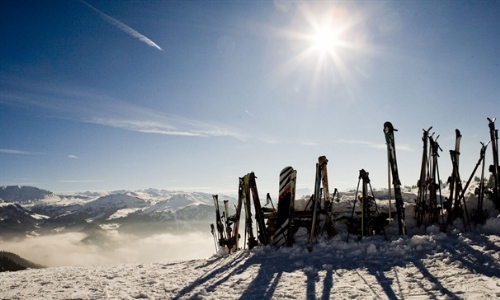 Alongside two winter sports equipment hire shops are all the conveniences you would expect in a local village, including a grocer, a baker, a hairdresser, the town hall, a post office, the tourist information centre and a beautiful church. Private Spa onsite with just sauna & Jacuzzi. Babysitting is available in the village. 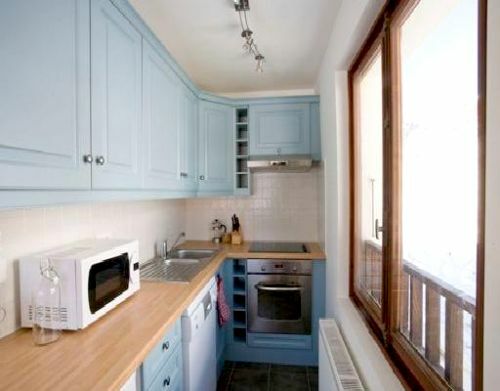 The chalet is well equipped with plenty of baby gear including: 2 x Wooden Cots, 2 x highchairs, 2 x baby monitors, 2 x sterilisers, 2 x baby baths, stairgates fitted on all stairs, socket covers, plastic crockery/cutlery/sippy cups. The chalet has a selection of Bath toys, kids books, general toys and a range of children's DVD's. For adults IPod Docks, DVDs, Flatscreen TVs, Wii/PS3 are available from reception. The Chalet offer a twice-weekly grocery-shopping service, allowing you to get on with the important business of enjoying your holiday. Plus a welcome hamper is provided on arrival and there is a breakfast delivery of bread & croissants. Sledges available in winter and there are plans to build a swing set and paddling pool area for the summer months. In the winter there is a crèche beside the local ski lift and the local ESF ski school offers lessons for kids aged 3+. Bar LEscale ( the onsite bar) is a relaxed and welcoming space invites you to relax with a cold beer, a glass of wine or a luxurious mug of hot chocolate. Plus it is also able to serve a selection of Savoyard specialities to accompany your drinks, or a 3-course menu of the day. Guests are asked to book dinner one day in advance. Stairgates are fitted on all the stairs. A daily turn down service is included and light cleaning. Log burning fire in the lounge.